This is a recap of my alternator build. 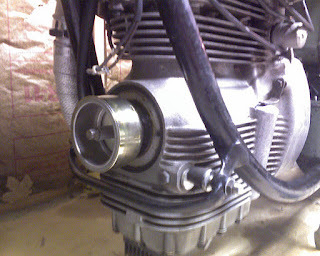 I’ve been frustrated with the original Lucas dynamo on my Sunbeam since I’ve been riding it. Neither the MC45O nor the MC45L (that I later purchased) produced enough electricity in a foolproof fashion. I don’t want to have to worry about if there’s enough charge in the battery to get me home anymore, and I want to run the lights all the time. I also don’t want an after-market alternator conversion that does not look exactly like the original. This is why I was determined to create an alternator conversion by myself for a small price. I submit the following to any interested do-it-yourself owners. I took suggestion from some Douglas and Vincent motorcycle owners who also have problems with dynamos. A few intrepid owners have taken permanent magnet alternators from modern applications and fit them inside the original dynamo cases. One particular application caught my eye while searching online for a suitable solution. 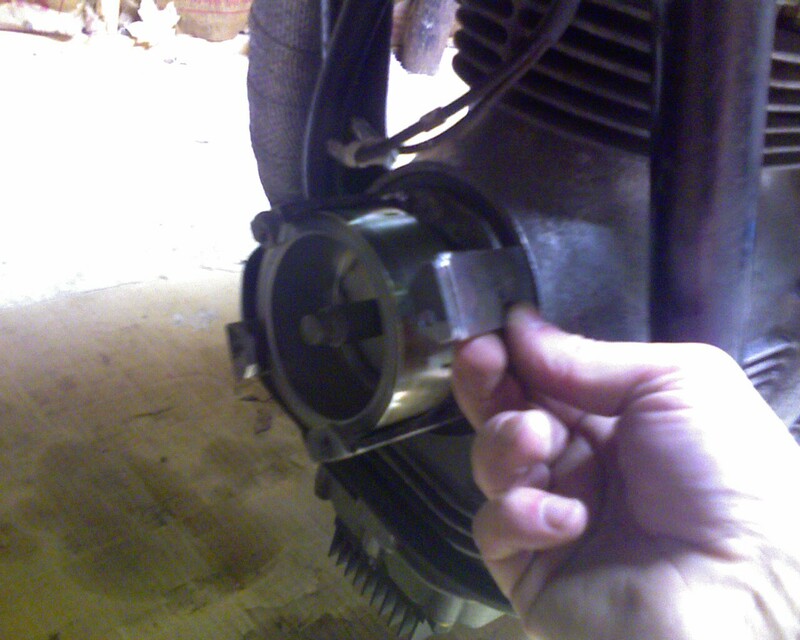 There is a simple alternator from a Kubota tractor that measures only 3-1/2” across and a little over 3” high. I bought model APM0001, which was the smallest available. This came as a self-contained belt driven assembly. I tested it briefly before taking it apart to see how easily it produced enough current being turned by hand to light the tail lamp bulb on my bike. 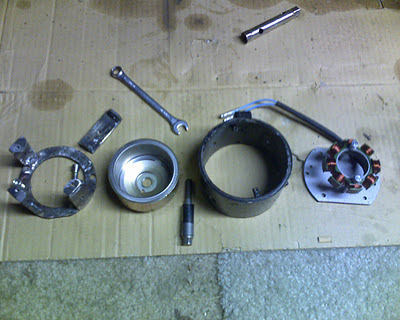 Removing the nut and pushing the bolt out easily disassembled the unit, shown in Figure 1. The back housing was discarded. The magnet cup was surprisingly powerful. It all fit nicely into the original dynamo case. There would be two major challenges. 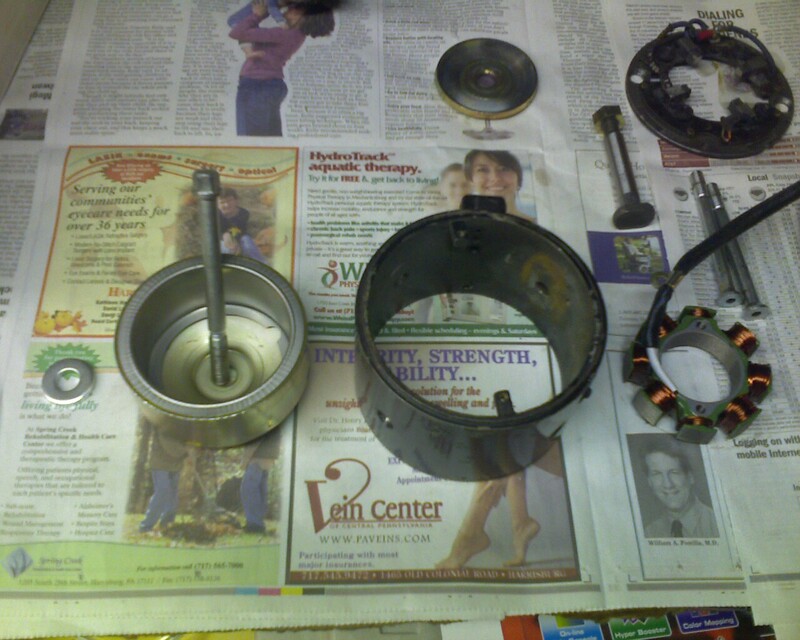 Fit the magnet cup to the crankshaft, and then to fit the case back onto the engine block so it all stayed together. 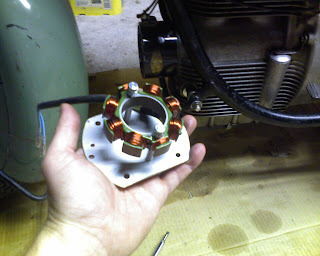 I elected to do the reverse of what the Douglas owners had done, and fit the magnet cup onto the shaft first, so that the stator would be accessible from the front of the bike. It sounded wrong at first, but it eliminated so many problems it was worth the effort, in my mind, to machine all the required parts on the lathe. There would have to be an adapter to fit to the end of the crankshaft, which included pins to fix the magnet from rotating independently from the crankshaft. This I spun out of round stock on the lathe to a relatively high degree of precision. I would use the original left-handed bolt so I didn’t have to machine another one. 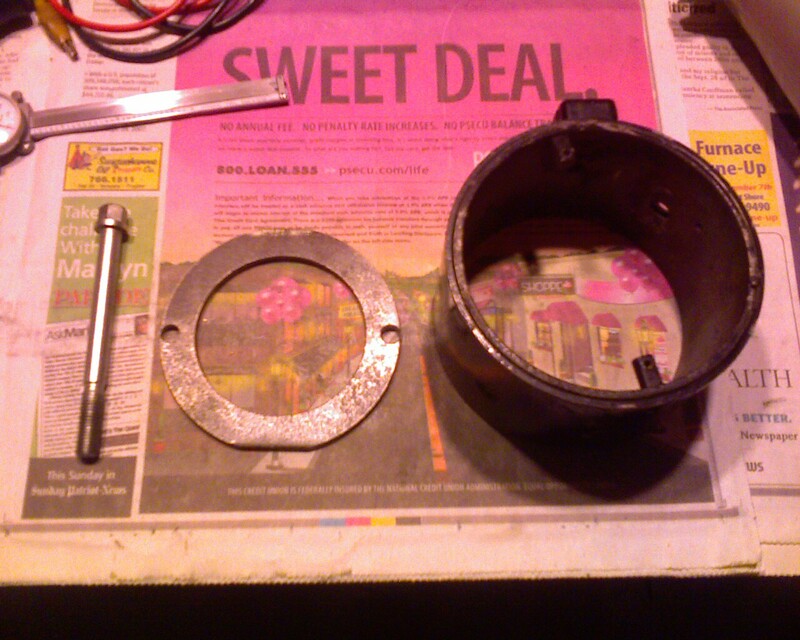 The outside casing would have to be secured to the engine block by means other than the two long bolts originally used, because they interfered with the outside diameter of the magnet. The wires could easily come out the front and affix to the original terminal block. Below is the solution showing the framework cage that was made to hold the outside casing. I could have welded tabs to the casing, but I didn’t want to modify it. The cage, at the left of Figure 2, goes on first. The magnet and center bolt (with spacer) then affix to the crankshaft adapter. The spacer holds the sealed bearings from the original Kubota unit, and another outside press-fit spacer makes up the difference between the stator and the outside bearing race. The fourth arm of the cage assembly encloses the magnet, before the case is slid onto the cage. The pole shoe screws fasten the case to the cage in such a way that it forces the case into the engine block firmly as the countersunk screws are tightened. The stator coil, at the right side of Figure 2, slides into the magnet which is centered by one of the bearings from the original alternator assembly. This took a brass spacer precisely machined out of an old pipe fitting. The wires tuck neatly up against the casing out of the way of the rotating magnet. 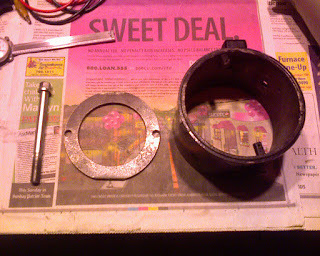 The outer plate bolts on with 6 screws and then the cast aluminum cover of the dynamo bolts to the outside of the case. 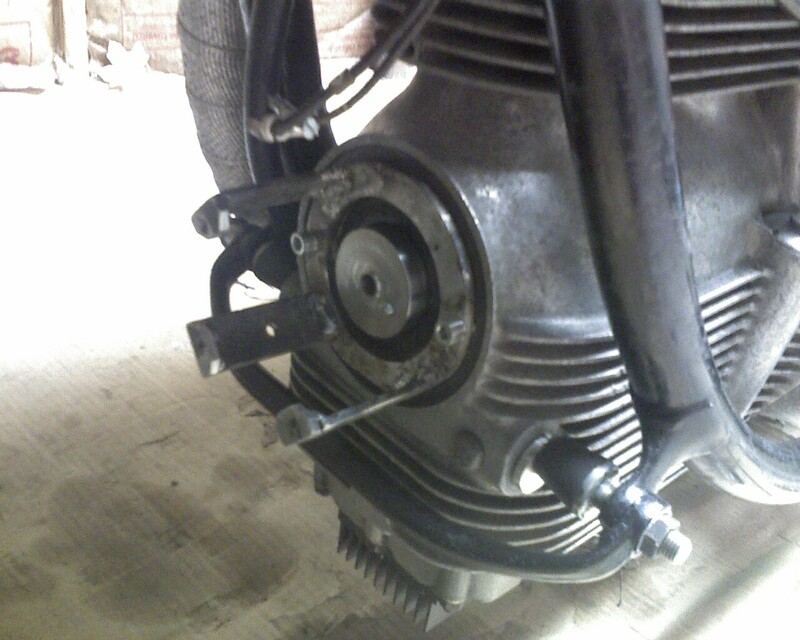 I’m quite pleased that the mechanics of my alternator conversion work well. The next challenge was to rectify and regulate the alternating current into direct current. Normal people would just have converted to 12 volts and put the Kubota tractor regulator in place of the Lucas MCR2 dynamo regulator. I had purchased a Rooster Booster 6 volt positive ground ignition module, and already had my 6 volt battery and lamps, so I was determined to stay with 6 volts for the present time. I know it’s not ideal, but I knew I could make it work fine. The 6 volt scooter rectifier/regulator that I bought was quickly overwhelmed by the 14 amp capacity (and probably the open circuit voltage capability) of the stator coil, and burned out. I ended up with a commercial shunt regulator from Electrex World LTD. I spent a lot of time on this project, but it met my goals. It looks original from the outside, it is reliable, and it was less expensive than the alternatives, as long as I don't count my massive investment of time. Looks good, and has given me an idea for a similar upgrade for the existing gear-driven dynamo on a vintage car.